Kathryn Thier is a nationally recognized instructor of solutions journalism and co-founder and co-director of The Catalyst Journalism Project, a research and teaching collaborative focused on the intersection of solutions journalism and investigative reporting funded by The Solutions Journalism Network and the University of Oregon. 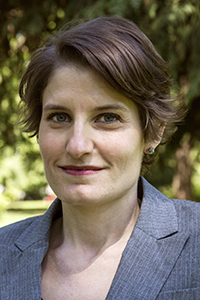 In addition to teaching journalism and public relations at the SOJC, she coordinates the Charles Snowden Program for Excellence in Journalism, a donor-funded, statewide journalism internship program open to all college students in Oregon. As a staff writer for The Charlotte Observer, Thier earned first-place awards from the Society of Professional Journalists and the N.C. Press Association and wrote a reader-favorite column about local development. She also covered local news and high school sports at Newsday. After leaving journalism, she directed communications and public relations for an e-commerce start-up and a North Carolina private school.